The cell. 4. Nucleus. Chromatin. Atlas of plant and animal histology. Chromatin is located in the nucleoplasm, surrounded by the nuclear envelope. Chromatin is DNA plus associated molecules, mostly histones, involved in DNA organization. 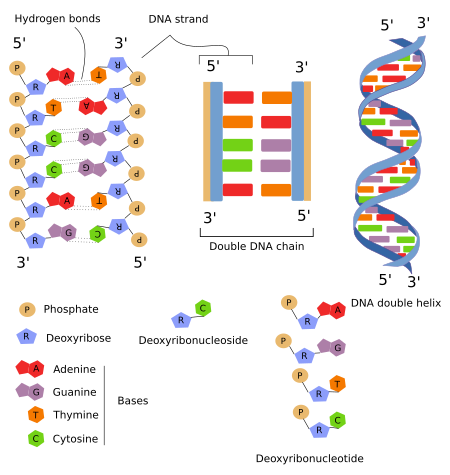 DNA is composed of 4 deoxyribonucleotides (abbreviated as nucleotides) (Figure 1). Every nucleotide contains a nitrogenous base, a pentose and a phosphate group. Nitrogenous base is either a purine base: adenine (A) and guanine (G), or a pyrimidine base: thymine (T) and cytosine (C). Pentose is a deoxyribose. Each nitrogenous base is bonded to a pentose resulting in a deoxyribonucleoside. Each deoxyribonucleoside is bonded to a phosphate group through the pentose molecule, together forming a deoxyribonucleotide. In this way, DNA contains a chain of nucleotides linked by phosphate groups. This is a single chain, but DNA is made up of two strands, which are paired by the complementarity of the nucleotide sequence. A-T and G-C, each nucleotide of each par in different chains, establish hydrogen bridges that keep the two DNA chains tightly joined. It is like rail tracks, where hydrogen bridges are the sleepers, and iron tracks are the phosphate-ribose strands. It is said that both chains join in an antiparallel maner because one of their ends is 3' in one chain and 5' in the other, whereas the other end is 5' in one chain and 3' in the other. Both chains are twisted in a double helix of about 2.5 nm in width. Nucleotides are not exclusively found in the DNA. They can be found as part of other molecules with different functions. For example, ATP (adenosine triphosphate) is the major molecule for energy transfer, and cAMP (cyclic adenosine monophosphate) is a second messenger of many molecular signaling processes in the cell. DNA is not naked in the nucleoplasm, but associated to proteins, most of them being histones. Other proteins forming part of chromatin are those involved in the DNA processing. DNA and associated proteins constitute the chromatin. Histones are DNA-associated proteins largely involved in chromatin organization. There are two types of histones: nucleosome histones (H2A, H2B, H3 y H4) and H1 histone. The four nucleosome histones, along with DNA, form the nucleosome. Nucleosome is the structural unit of chromatin organization. Other proteins are transiently associated to DNA, such as those involved in the DNA transcription (gene expression), DNA synthesis (replication), or chromatin compaction into heterochromatin and chromosomes. Figure 2. Transmission electron microscopy. 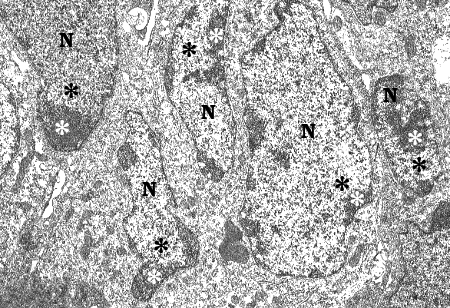 Nuclei (N) of ependymal cells of a fish spinal cord. 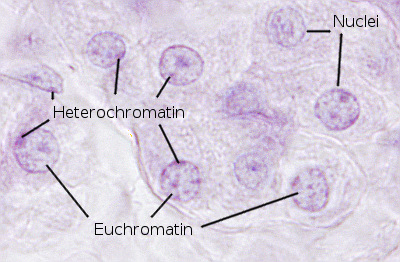 Black asterisks indicate euchromatin, loosely arranged and more clear. White asterisks indicate heterochromatin, more dense and compact. Figure 3. Light microscopy image of cells of a mammal intestine stained with haematoxylin. Nuclei are rounded and show intense and clear stained areas. Nuclear dense areas are heterochromatin, where more dye is present, whereas the more faint areas are euchromatin, where less dye is observed. Euchromatin usually includes DNA regions being transcripted, whereas heterochromatin DNA regions not being transcripted or showing low transcription rate. Heterochromatin is classified into facultative heterochromatin, if it can alternate between euchromatin and heterochromatin, and constitutive heterochromatine, which is always condensed. Facultative heterochromatin is up to 10-20 % of the total heterochromatin. Although some genes have been found to be expressed at heterochromatin, most are not. There is a higher level of chromatin compaction when chromosomes are formed, either in mitosis or meiosis. During this process, both euchromatin and heterochromatin are packed into chromosomes. If we think that the nucleus in interphase is a mess of chromatin after chromosome decondensation, it is difficult to imagine how the cell is capable of managing chromatin to condensate, decondensate, and to regulate and express a specific set of genes without making a huge entanglement. Far from being a tangle, in 1980, it was observed that chromatin from a particular decondensed chromosome occupies a well defined region in the nucleoplasm (Figure 4). These territories are rather spherical, from 2 to 4 µm in diameter, and those from different chromosomes are only overlapped in the borders (in yeast, however, territories are not so well delimited). Further evidences support that the distribution of these territories in the nucleoplasm is not random. For example, the distribution pattern may differ between cell types, differentiation stages, and along the cell cycle, but it looks like that the spatial relation between chromatin territories is quite stable in the same cell. More active territories, i.e. having more intense gene expression, are located toward the center of the nucleus, whereas the less active territories are closer to the nuclear envelope. Territories are not homogeneous. For example, in the same territory, regions that are replicated during the first part of the S phase (early replication regions) are different from those replicated later of the S phase (late replication regions). The interaction between chromatin and the nuclear lamina of the nuclear envelope helps to segregate and form these regions. It is curious that chromatin from homologous chromosomes occupy different regions in the nucleoplasm. Figure 4. Nuclear organization of chromatin during interphase (modified from Cavalli and Misteli, 2013). In each chromosome territory there are regions or domains. There are repressed chromatin regions: policomb chromatin, heterochromatin and other less characterized regions. The open or active chromatin may contain regulatory sequences, promoters, transcriptional sequences and sequences bond to insulator proteins. Despite this, domains do not precisely determine genes behavior. Repressed chromatin does not appear to interact with other regions, whereas open chromatin may do it, even with regions of other chromosome territory. 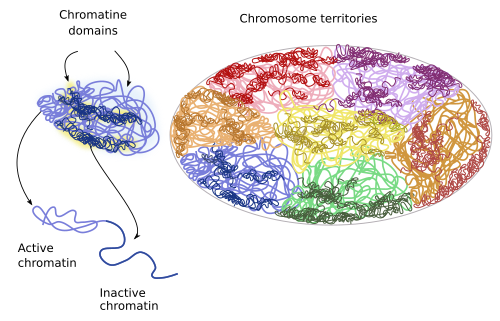 The mechanisms that set the chromosome territories involve local interactions between chromatin loops. For example, active chromatin tends to interact with other nearby active regions, instead of with repressed chromatin.